There was an era when a user interface was considered very primitive. But with time, we have seen a massive change in the arena of user interfaces. As computers and technology have become more mainstream, interfaces have become more intimate and advanced in ways sometimes unimaginable. This blog post explains the journey of the user interface and the revolutionary impact that it has managed to create. Since we are talking computers and technology, let’s start from there. The first computer user interface consisted of a large button which was located on the front panel labelled “0”. This button was pressed repeatedly in order for users to programme the computer to do various tasks. With time, the keyboard was introduced. However, these first computers were built for computer operators or programmers only. Interfaces were designed and built for people who could study them thoroughly and become experts. But even though there was a visible change in technology, the earlier years didn’t see a change in the intended user base. Information on computers was organized hierarchically while the monitor and the keyboard were the only way for the software and humans to have a connection. This completely made sense at that particular time period. Since typing was considered a form of writing, written or spoken words were considered a type of human interaction. If you would notice, even programming languages are also built around this exact principal. A user / programmer types instructions while the software in turn translates into hardware language giving us the end product that we need. 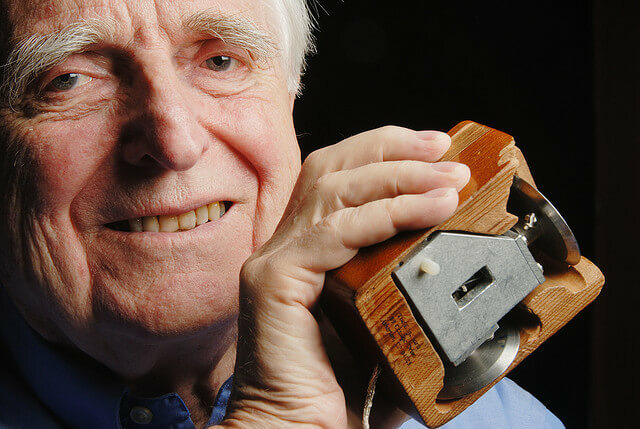 In the early 1960’s, Douglas Engelbart invented a device called “The Mouse” offering users a new interaction model which pointed at things on the monitor. Even though this took some time to catch on, this invention was considered an important milestone. The reasons being that instead of unmanageable keyboard commands that most users were finding it hard to grasp, a user interface designer was able to offer you menus which allowed the user to discover the software capabilities that were available. It also allowed users to move items on screen from one place to another in a much more convenient manner. For the first time since the introduction of the computer, you did not have to be an expert to use the device. The computer itself offered you a menu consisting of several options.The early 1970’s Xerox was able to introduce the Graphical User Interface coming up with the desktop metaphor and allowing users to use more options. This was totally unexpected and was at first an experiment and finally ended up to prepare documents using Xerox printers. Later on some of the guys from Apple Inc visited Xerox labs and borrowed a few ideas in exchange for company stocks. After a few pre-hand releases, in 1984 we saw the release of the “Macintosh” by Apple Inc which introduced users to a new type of computing. This machine was targeted at real people to perform day to day tasks making access to the personal computer more convenient. This idea continued successfully and was later a stepping stone to create Windows and Windows95 operating systems which would later define an entire generation. When technology evolves and becomes easier to use, clearly it becomes more popular. However, it was not until the early 90’s that technology really managed to change the world. A perfect combination of commodity hardware, well marketed software and the internet certainly made it possible for every home to aspire towards technological superiority. As users were getting used to the technology they realized that either there was a massive potential for knowledge, commerce or communication or it was clearly hard to use. This was because the progress of tools for user interface and experience design was somewhat still in their infancy stages. Although the computer revolution in the 1990’s was found to be exciting, the technology made users nervous. For much of the 90’s the look of the computer and the user interface as well as the experience was the same. The only exciting thing was the World Wide Web which offered users information and ways to connect into the home front and work place which was not possible earlier. The browser however, in the beginning didn’t do much to push things forward. There were so many new programmers and players in the field that user interfaces did not make much sense. Users were stuck without knowing what to do. It was not only the personal computer that offered users the technology experience. Walkman’s and CD players were introduced where the primary interface was still hardware buttons. By the end of the 90’s Napster introduced a new technology that could bring together music and computers. There was even peer to peer music sharing. Then there was the portable mp3 player but it wasn’t till the iPod was introduced that people were interested in using these scientific gadgets. Up to date with the combination of iTunes which is the largest music library online, the iPod is the best selling music device. Meanwhile there was also an uprising in the revolution of cellular phones. As the technology evolved, phones were given smaller LCD screens and also enabled users to send short messages to phones via cellular networks. Typing relied on the phones keypad with a T9 system. Again Apple and a few other leaders in the industry came up with smart phones and PDA’s. During this time with various introductions and modifications especially from Apple and Microsoft, there was a huge change in the entire system. We saw the amalgamation of the desktop, cellular phone and the portable music player. Apple turned them all into one single device. It was the iPhone, although it was not the 1st smart phone, it was the first phone with a capacitive multi touch screen. Capacitive meaning that it reads the electrical current that runs through your body. So, for the first time in history, direct manipulation was introduced offering users the best user experience. No keyboards and mouse was connected. Everything was carried out by a simple touch. When it comes to mass consumption in technology, the visual and interaction design is built to mimic the hardware which is called “Skeuomorphism”. This has been the main stage of UI design since the birth of the desktop metaphor. With the introduction of the iPhone, this style became more popular. Retina screens were introduced so that images and texts were clearer. Some of the apps that are found in the iPhone imitate the real deal. An example is the calculator which looks like a real one. The revolution is quite clear while now you see a clear flat design offering touch technology. This is what user interface design is known as. You have to take things people already understand and use them to help them understand new things. The current design revitalization has made users aware of the importance of usability and interaction. The role of design is not merely a by product anymore. Software and hardware runs in par right now. Both should be the best to offer people the best user experience. A user should be able to think about what they want to do instead of wasting time on how to use them. Interface in particular is about imagination. Programmers dream, build and refine until the end product looks more and more like science fiction that was foreseen in yesteryears. Touching and typing which was mainstream yesterday might be talking and thinking tomorrow. But you have to remember that whatever the interface is, it will be made by people for people to use. These things are made possible because we aspire and dream of better tools to connect with each other.